I love the nature and tranquility of my yard. The variety of birds that come throughout the year is amazing. Some fly to the feeder hanging in the garden. Others come to perch in the trees and bushes. Some do both. I’ve seen unusual birds like scarlet tanagers, baltimore orioles and bald eagles. I also get more usual sightings like cardinals, towhees and finches. A couple of weeks ago, my friend Steve dropped by. Like me, he’s an avid gardener, and sometimes we exchange seeds or ideas. As we were sitting next to one of my raised beds, discussing the merits of soil pH, there was a rustling in the pines. We looked up to see a feathery creature stumbling along the branches. 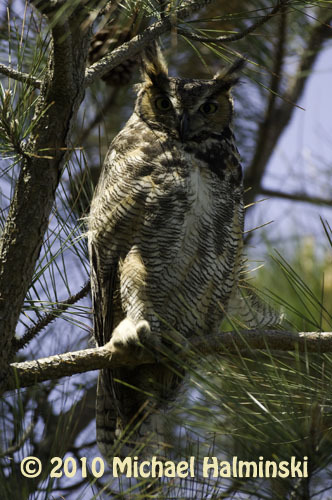 It was a young great horned owl clutching a limb then jumping to another. We could hardly believe it. We all stared, checking out each other. The young bird was clicking it’s bill, and glaring at us with big yellow eyes. It was an amusing sight. We looked for 20 minutes not realizing that we too were being scrutinized. 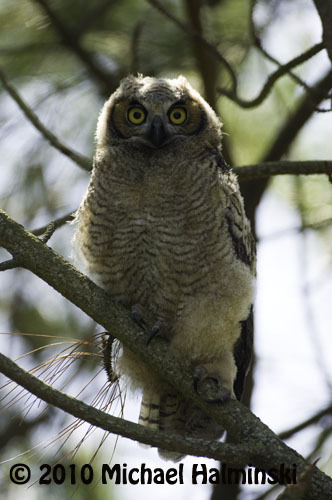 Unbeknownst to us, there was an adult owl perched in an nearby tree, and it was watching us the whole time. The next few days I saw them again and again, and wondered why they would stay here. The juvenile, only a few months old, still had some downy plumage, yet was able to fly fairly well. A nest 30 feet up in a tree gave me a clue. Could it belong to them? It looked so small. 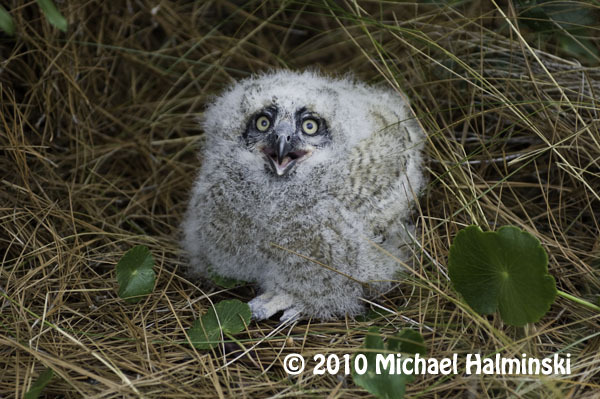 I remembered the baby great horned owl that we rescued 2 years earlier, after it fell out of a nest. That youngster had been raised in a nest even smaller, but it worked. Well, sort of. 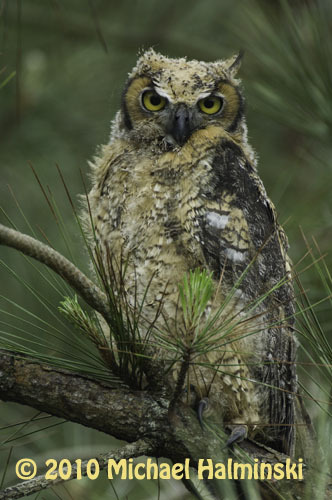 I learned that great horned owls use nests built and vacated by other birds. Locally here on Hatteras, they nest in January or early February, long before most other birds are doing it. 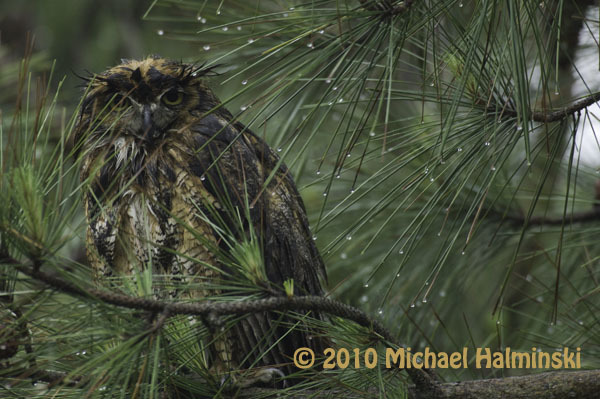 This 4-week old owl had fallen onto soft pine straw from a nest 25 feet high. Now I’ve been watching these raptors for 3 weeks. During the day they roost nearly motionless in the branches. They move around a little, depending on the comfort zone. At times they get harassed by mocking birds, but other than that you’d never even know they were there. They blend in beautifully. If my theory about their nest is right, then they’ve been in my own back yard for 3 months without me knowing it. The adult gets a morning snooze. The adult after a long rainy night of hunting. The juvenile is just getting its feathery horns. Natural born killers, they are perfectly designed for what they do. At dusk they get active. They’re silent, stealthy fliers. At night, I’ve seen them perched on power lines, rooftops, on my osprey platform in the marsh, or at my neighbor’s fish house looking for prey. Then the next morning, I find them nestled stoically in the same group of trees. It’ll be interesting to see how long this continues. 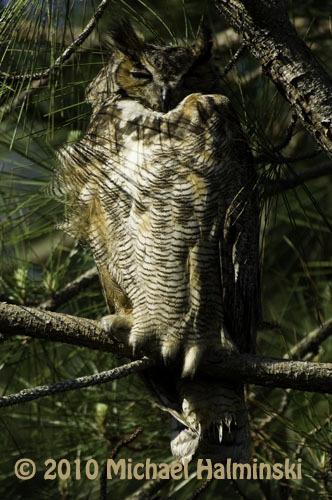 This entry was posted in Birds, Outer Banks on May 21, 2010 by j0jgvm89bj.